As he kicked off his day-long campaign in Kerala, Rahul Gandhi slammed Prime Minister Narendra Modi for being the "most anti-national". Congress President Rahul Gandhi began his campaign in Kerala's Wayanad, one of the seats from where he is contesting, by offering prayers at the Thirunelli temple today. Ahead of his campaign, the Congress president has launched a new Twitter account named 'Rahul Gandhi - Wayanad'. 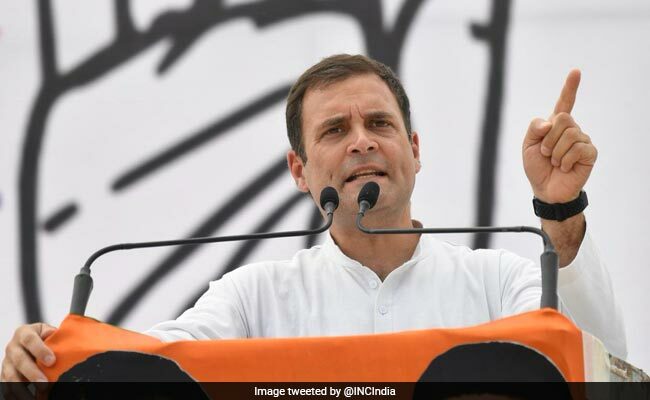 As he kicked off his day-long campaign in Kerala, Rahul Gandhi slammed Prime Minister Narendra Modi for being the "most anti-national" and accused him of "dividing the nation". Reacting to PM Modi's allegation of the Congress turning anti-national, Mr Gandhi said his grand old party has an exceptional track record of fighting forces that attack the nation. He also addressed rallies in Kozhikode, Wandoor and Palakkad. Speaking to reporters in Kannur after the Parliamentary coordination committee meeting, Rahul Gandhi held PM Modi responsible for the rising unemployment among the youth, farmers'' suicides and allegedly giving Anil Ambani Rs 30,000 crore as part of the Rafale deal. system and forcing thousands of farmers to commit suicide is anti-national behaviour," Mr Gandhi said. "I am not like the PM of India, I'll not come here and lie to you because I respect your intelligence, wisdom and understanding. I don't want to have a relationship of a couple of months with you, I want to have a life long relationship with you," says Rahul Gandhi in Kerala's Wayanad. "I have not come here as a politician who is going to tell you what to do or what I think. I am not here to tell you my 'Mann ki Baat', I am here to understand what is inside your heart, your soul," says Rahul Gandhi in Wayanad. Rahul Gandhi addresses public meet in Wayanad. Rahul Gandhi attends coordination meeting of three parliamentary constituencies. Accordin to news agency ANI, Congress General Secretary KC Venugopal on Rahul Gandhi's temple visit in Wayanad says: "Last time also he had wished to come here but because of security restrictions, he could not do it. Here is the place where the ashes of Rajiv Gandhi were immersed, in Papanasini river." "As per pujari's (priest) directions he has performed all rituals for his grandmother, father, forefathers and victims of Pulwama incident." 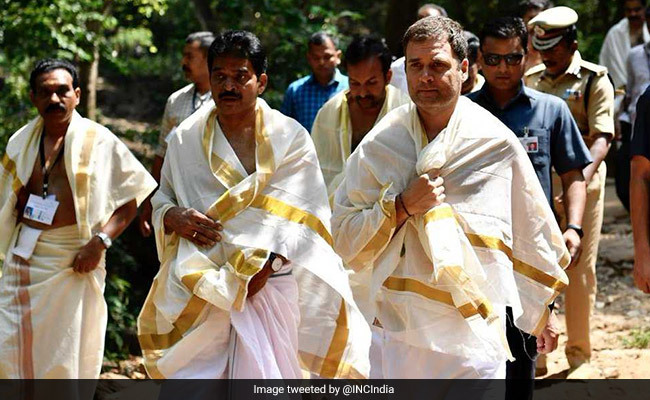 Rahul Gandhi performs rituals, after offering prayers at the Thirunelli temple in Wayanad, reports news agency ANI.